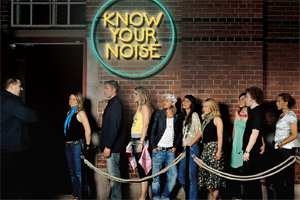 In November 2014, Know Your Noise was the first campaign to be launched under HEARsmart. • an online noise risk calculator that enables users to discover their personal risk of developing hearing loss as a consequence of their current listening habits, such as going to nightclubs, music concerts or after using personal music devices. It can estimate noise exposure risk based on lifestyle habits and offer simple suggestions on how to optimally manage these risks. Dr Elizabeth Beach, a researcher from the National Acoustic laboratories in Sydney, and her colleagues Drs Warwick Williams and Megan Gilliver were responsible for the Know Your Noise project and have done much of the work that has influenced the development of HEARsmart. Dr Beach said, “Know Your Noise was developed to provide accurate and meaningful information about noise exposure and its impact on hearing health. It offers personalised information that’s directly relevant to the individual and their own situation. We hope that people will try out the calculator and find out whether their levels of noise exposure (at work and play) are putting their hearing at risk. It’s amazing how small changes in behaviour can alter your risk in the longer term”. The campaign to raise awareness of the Know Your Noise site was driven by the distribution of postcards Australia-wide (via Avant Card). There was also a dedicated social media campaign through facebook and twitter @HEARsmart_. The team were delighted that the story was also picked up by Channel 9 News when it was first released, reaching a huge audience across Australia. You can watch their news story below. “One of the key learnings to come from the Know Your Noise Campaign was our ability to successfully engage our target audience by using various different but complementary approaches. Getting our messages out through traditional media, social media and websites that young people hold in high regard, can create an ongoing awareness that we hope, given time, will result in a change in behaviour around loud sound,” Dr Elizabeth Beach.